For you, space, serenity, soft curves in the quiet of the old houses. Dar Bounouar, large character house with balanced proportions, welcomes you for your stay in the heart of the Medina of Marrakech and 10 minutes from the famous Jamaa El Fna. 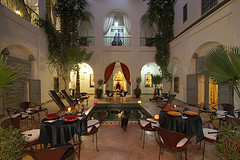 Personalized, discreet and attentive service, table where are rediscovered and reinvented every day Moroccan flavors, you can swim all year round in a beautiful, real marble pool. You will also have at your disposal the beldi hammam, massages and treatments that will be valuable assets for your stay a memorable marrakchi. 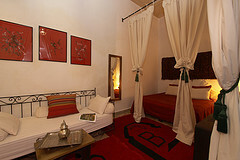 At the heart of the medina of Marrakech, the guest house Dar Bounouar welcomes you in its unique and privileged space. 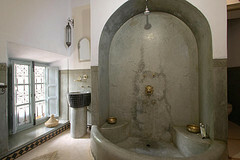 This old and beautiful and authentic traditional riad 1000 m2 completely renovated offers 11 beautiful spacious suites around a beautiful flowered patio with a swimming pool. 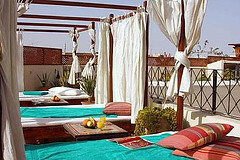 Beautiful terrace overlooking 360 ° across the medina overlooking the Koutoubia and the Atlas with its snow-capped peaks. 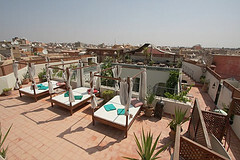 With Douiria and space pool Riad Dar Bounouar can accommodate 31 people. We have made every effort to specialize in birthdays, wedding, and this group by theme and in harmony with our personal atmosphere. Quality renovation respecting the traditions, spacious rooms, with seating area equipped (satellite TV, wifi, air conditioning, heating) All bathrooms are equipped taddelack dry – hot towel.